You know, the moment after your feet leave your slippers, but pre-under-blanket snuggle is an important one. 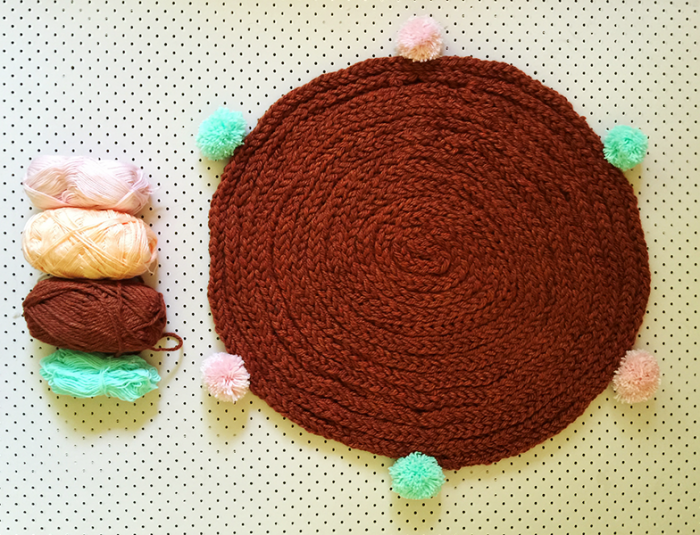 Hence, I’ve hatched this easy-to-make bedside rug! Not only does it take just a few hours in front of Outlander/Game of Thrones to complete, it a welcome home for tootsies at the snoozier end of the day. 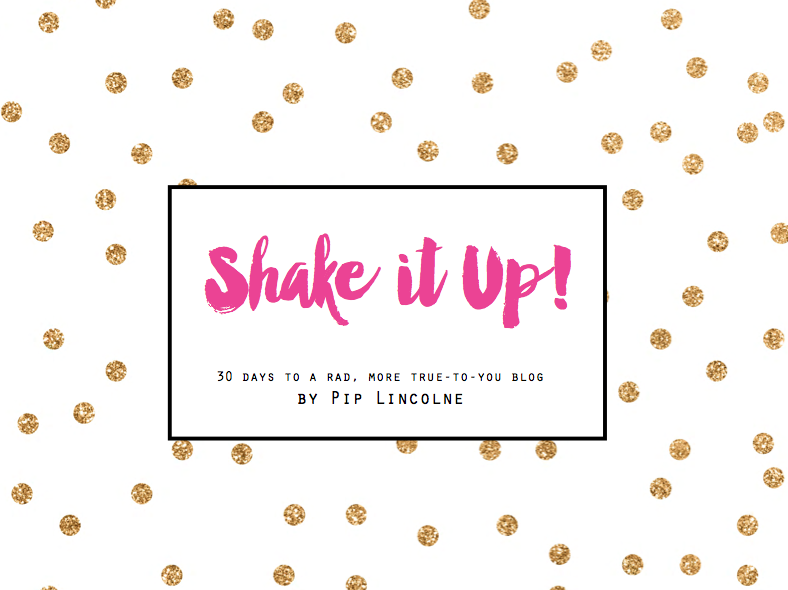 Also… when you get up in the morning, and your feet hit the floor, they will really be glad to hit this little project rather than scratchy carpet or chilly floorboards, don’t you think? I think yes. This colour is called : Yosemite. I think it could also be called ‘Gimme Cookie’. 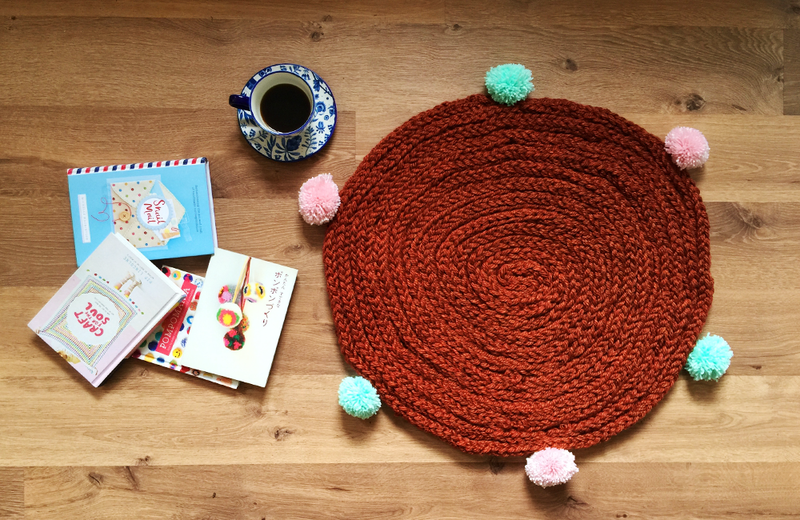 If you make this you will need the following cosy things. 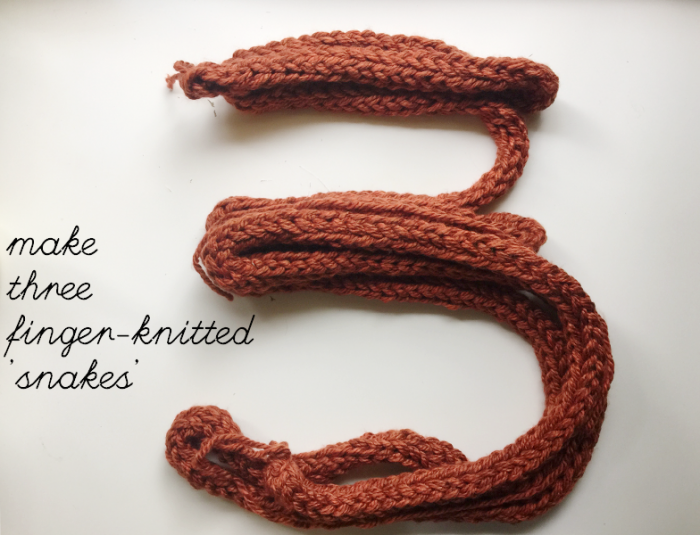 Do this 3 times – finger knitting two skeins at once – to create a long knitted length. THREE TIMES! 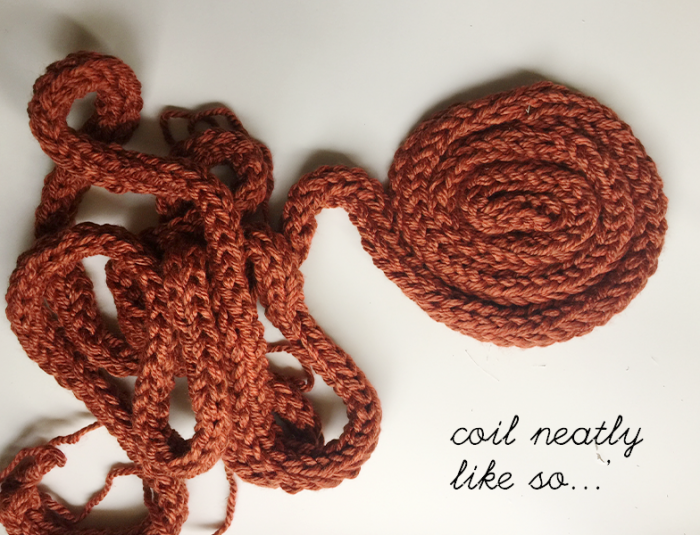 Find a clear and clean spot on the floor and coil two of the yarn ‘snakes’ together (just coil one, then the other) matching the ends and keeping the coil neat and flat. 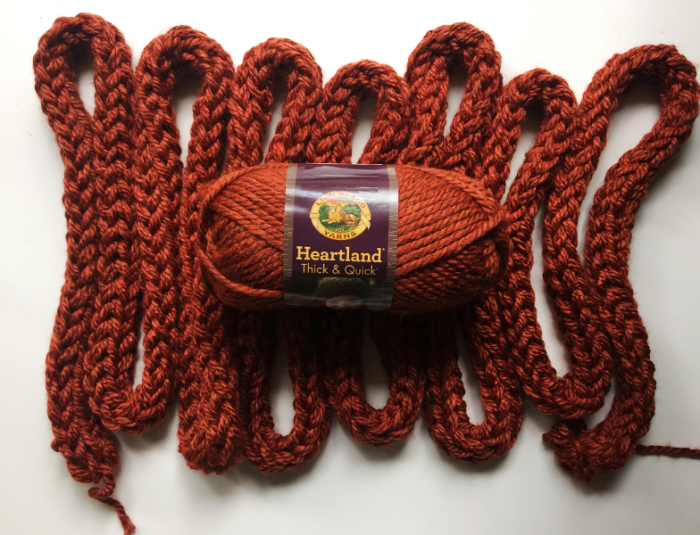 Now thread your yarn needle up with a long length of matching yarn (70cm or so will do) and begin gently stitching through the coils to secure them. Don’t pull to hard or you’ll get a wonky shape. 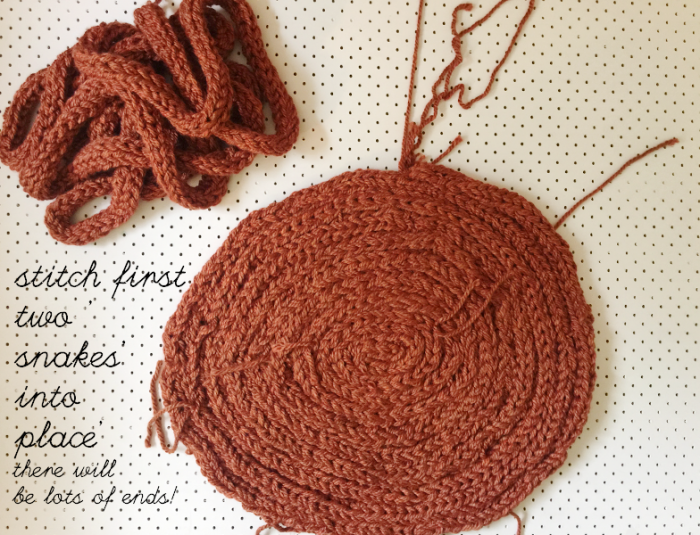 Make sure you stitch through the centre of each yarn ‘snake’ so that your stitches are invisible. This will take some time, so put a movie on and make a party of it. Check your work as you go – gently lifting the rug-to-be to see that it’s all getting nicely stitched together. I did a kind of criss-cross type pattern through the middle of my snakey lengths. 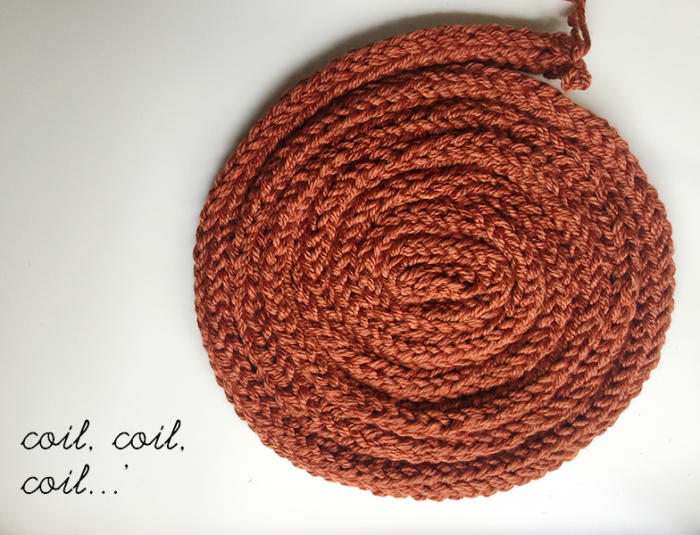 Once you’ve stitched the first two snakes into a coil securely, wind the final snake around the coiled rug-to-be. 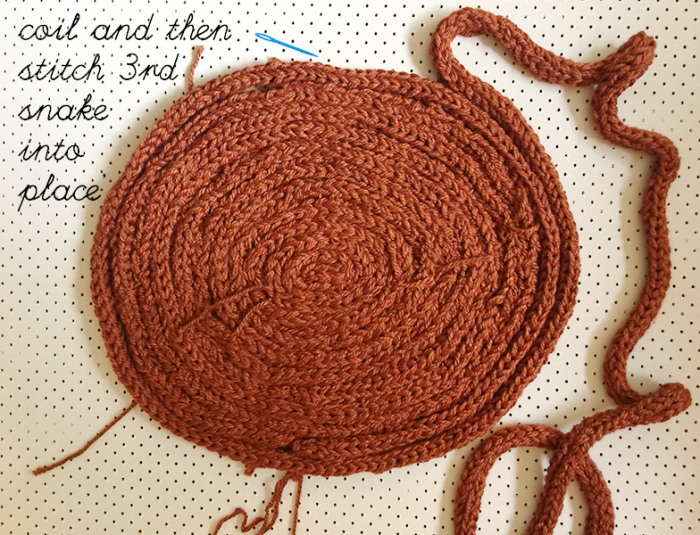 Stitch that into place too, again taking your time and being careful to hide your stitches, secure it all and not pull your coil in at the edges. This final snake is an opportunity to neaten up any slightly wobbly edges, so take it slowly and surely. Fasten off each yarn length you use for stitching securely with a firm knot or two, and a bit of extra tail to weave in and hide. 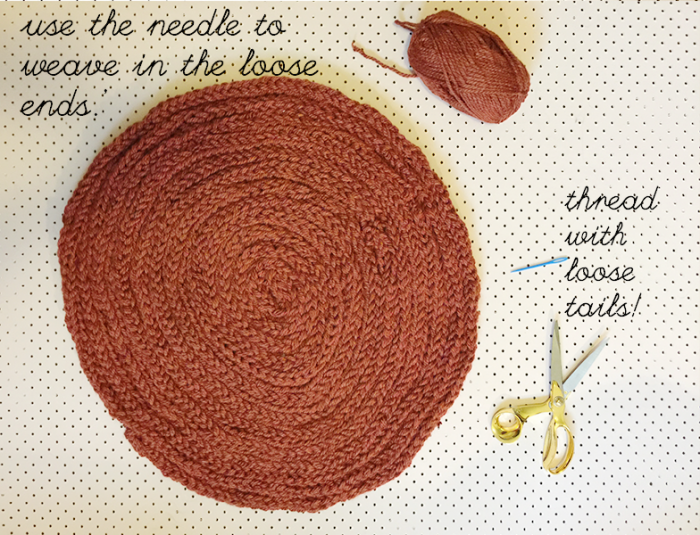 Then use your yarn needle to weave the loose yarn tails into the work. 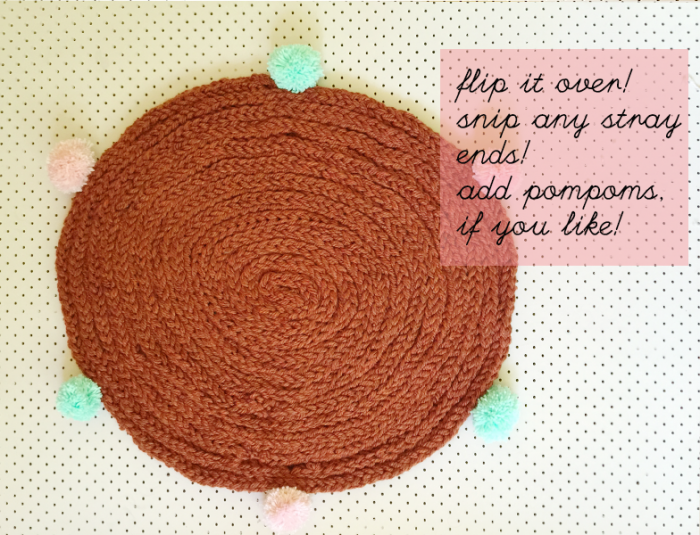 Add pompoms or use as-is! 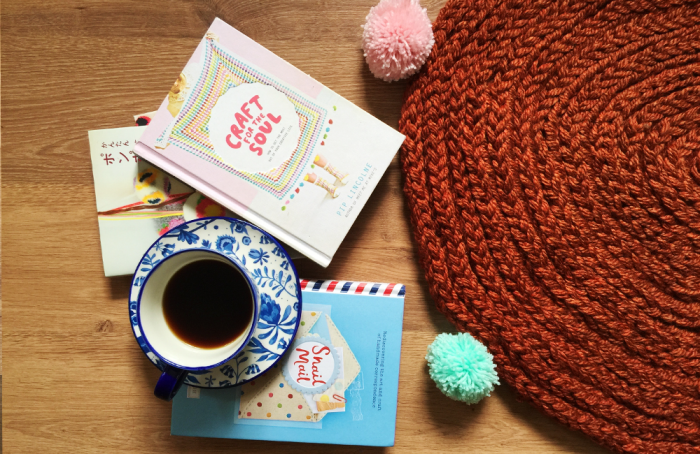 Note: Obviously this rug is not going to stand up to high traffic, but it’s a cosy-cute Winter accessory and would be perfect for post-slipper use! How about YOU?! Do you need to have cosier toes? Are you ready for some finger-knitted-snug-life?! Love this idea! 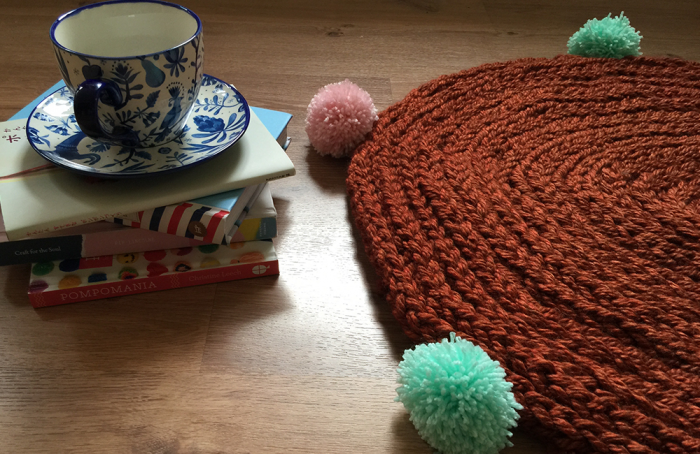 The pom poms make it extra cute. Will have to give this a go for myself!